Spring fishing is my favorite. I think watching winter lose grip in our part of the state is magical. Birds of all kinds flock to flooded fields, new born calves buck and run. Red tail hawks sit on fence posts along the roads. Trees start to bud and birds return to nest along the river. What really gets me excited is the fact that trout start to look up! After a Long winter of staring at indicators, I am ready to see some hatches and rise rings! The box has not changed much over the last couple of weeks. One thing that has not changed is you still can’t drive to the boat ramp. You can drag a raft down to the water or tow a boat down with a sled. Once down to the river you will notice midges…lots of midges! I have yet to find a spot in the box where you will find bigger fish eating them on the surface consistently. If you go armed with zebra midges and rubber legs however you can plan on a busy day in the box. The weather has been hit and miss up here. As a matter of fact it was snowing when I got up this morning. I would make sure you’re ready for any weather conditions. The current flows are over 500 cfs so plenty of water to float. 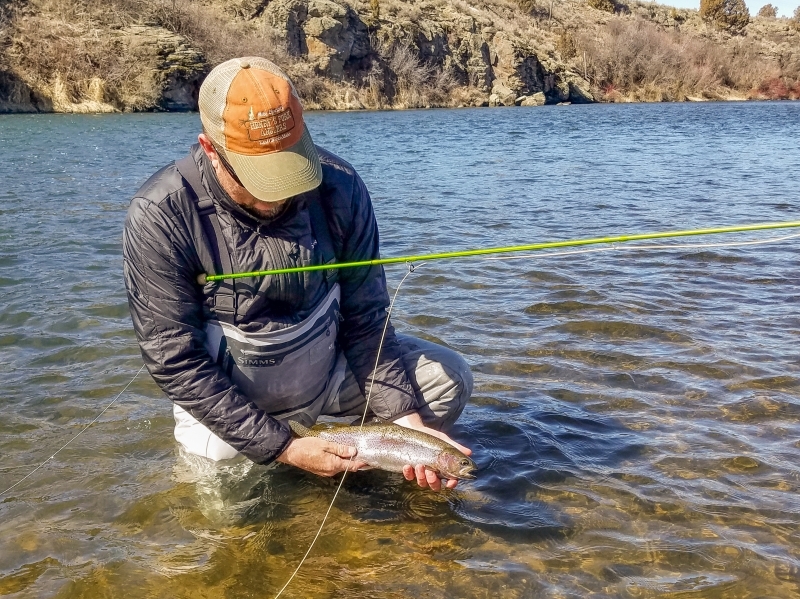 The lower Henry’s Fork has really come alive. The Warm River to Ashton stretch is accessible but you’re going to have to drag your boat over the snow bank at the launch. The jump off canyon access is still not an option but I will bet that changes soon. You will not have any problem taking out at the Ashton ramp. I would have blue wings and your favorite midge pattern. I like a #16 Griffith gnat. If it’s not broke don’t fix it. A Griffith gnat is a midge cluster pattern. While a single midge is a #20 or smaller a midge cluster can be a #1/0. 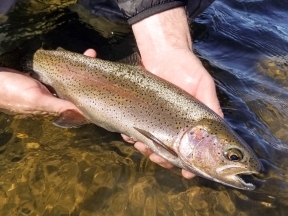 The Griffith gnat is also easy to see on the water and if presented correctly even the most stubborn trout will eat it. I would have #10 and #08 brown or black rubber legs and #16 zebra midges. I would also take some #10 and #12 green or purple chubbies. You will see some skwalla’s on the water. The fishing from Ora bridge on down has also been good. The midges are really coming off in good numbers down there and you will find good numbers of fish up eating. 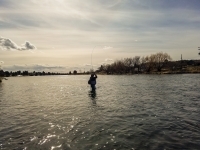 Be aware of the spawning beds on throughout the Henry’s Fork. The Madison has really been good these last few weeks. Take all the same patterns that I have mentioned above. I would also have some streamers handy. I spend most of my time in the walk wade section. If you’re willing to do some walking you can find some water to yourself this time of the year. The South Fork has been running around 10,000 cfs for the past week. If you are heading that way I would focus efforts on the upper end. The water on the lower end is off color. I would also make sure to check flows before you head out. I would guess the river may come up more as we lose snow. 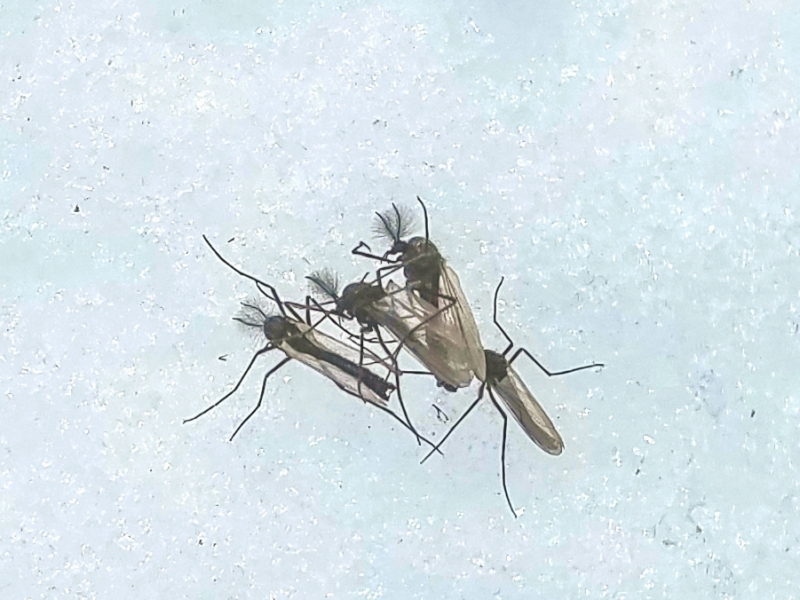 Call the shop or check www.waterdata.usgs.gov Look for both midges and blue wings on the South Fork. The Teton has been big and very dirty over the past week but it has dropped nicely. It should provide some great fishing from here out until the runoff starts in a few weeks.